Agile isn't a well-defined framework or process, but a mind-set and collection of values and principles for organizations that wish to become more responsive to changing conditions. Agile has its roots in the 'Agile Manifesto' drawn up by a group of software developers back in 2001. It is also influenced by the concept of lean management, which was originally developed by Toyota to improve the production processes in the car manufacturing industry. 4 What is agile service management? 6 How to apply agile principles as a provider of services? 7 Does Agile replace ITSM and service management best practice? 8 Why is Agile so popular? 9 Is Agile for all service providers? 10 Are the YaSM process templates compatible with Agile principles? 11 Where can I learn more about Agile? Agile software development is an approach to 'lightweight' software development under which requirements and solutions evolve through the collaborative effort of self-organizing cross-functional teams and the customers. It advocates adaptive planning, evolutionary development, early delivery and continual improvement, and it encourages rapid and flexible response to change. It's important to understand that the manifesto does not suggest the items on the right are dispensable, but the items on the left are valued more than the items on the right. As an example, tools and processes have their uses, but competent people working together effectively are more important. "Welcome changing requirements, even late in development. Agile processes harness change for the customer's competitive advantage." Read all twelve principles on the Agile Manifesto website ! Over the years, several methods and concepts have emerged to support agile software development . Some of these methods describe programming practices, while others are about managing the flow of work or the specification of requirements. Scrum advocates product development by teams in short iterations called 'sprints'. A sprint is a time-boxed iteration of work during which an increment of product functionality is developed and implemented. Sprints are typically two to four weeks long. 'Product backlogs' are used to manage the list of product requirements. Inputs to the product backlog can come from many sources, but it is owned by the product owner, who is responsible for prioritizing the items in the backlog. Kanban is a method for managing work items. Wok items are typically visualized with Kanban boards. A key principle in Kanban is that work is 'pulled' as capacity permits, to limit work in progress and improve the flow of work items. Kanban eLearning - Concentric Circle Consulting . Agile service management is the application of agile principles in service management, helping service providers to become more flexible and responsive to changing customer needs. Originally, the Agile approach was devised for software development. More recently, however, agile principles have been tried in various other areas, including electronics, financial services and healthcare. And Agile is also gaining traction with service providers. Training institutions have started to offer Agile service management training, teaching service management professionals how to integrate agile thinking into service management processes. In addition, some training providers offer 'Agile Service Manager' certifications. The Agile Manifesto relates to software development, and a bit of 'translation' is therefore required to adapt the agile principles to the domain of service management. For example, what does 'Customer collaboration over contract negotiation' mean in the context of services? Surely, there will always be a need for formal agreements, because business relationships cannot work if it's completely unclear what kind of service is to be delivered at what price. Be flexible when a customer asks for a new service, or a variant of an existing service. In short, while there is a place for service contracts, agile service management will value more the ability to understand what is important to the customer and to act accordingly. A complete (inofficial) 'Manifesto for Service Management Agility'  has been suggested by Robert Falkowitz. How to apply agile principles as a provider of services? Apart from being somewhat flexible about contracts, there are many other ways for service providers to apply agile principles and speed up their business. Agile values and principles can be embedded into every service management process, from service design through implementation to continual improvement. Organizations may, for example, provide services in an agile manner, using agile techniques to design and implement services in small, frequent releases. The first cycle could deliver a minimum viable service, which is the smallest amount of functionality that is needed. This enables early use and feedback, which is then fed into the next incremental cycle. Agile techniques can also be applied to improve services. Service owners should be empowered to improve their services, and updates should be designed and implemented using a regular, short cycle. Improvements can be managed as a 'service backlog' and implemented in sprints. Assigning accountability for services across the whole service lifecycle to self-organizing cross-functional teams. Increasing efforts to understand what users value in a service. Defining simple processes with a clear structure and removing unnecessary tasks (an approach often called 'just-enough control'). Using agile techniques such as Kanban to manage service and process improvements. Does Agile replace ITSM and service management best practice? There are many benefits of the Agile approach, but Agile does not specifically provide advice for the management of services, and organizations cannot function with self-organizing, unrestrained cross-functional teams alone. The agile teams need to be aligned with the overall objectives of the organization, so constraints are necessary. This is where the time-tested service management frameworks come into play: They describe processes such as service strategy, customer relationship management, service portfolio management, etc. that provide direction to the agile teams as they design, develop and deploy services. Some of the established service management processes can also act as guardrails for self-organizing teams. For example, the compliance management process establishes the policies and controls that are required to ensure compliance with laws, industry standards, etc. What's more, the Agile approach is best suited to product and service development, but there are many other essential areas in the organization that should not be forgotten amidst the drive to become agile. For example, good customer service is a key capability for any service provider, and it needs to be provided efficiently to keep costs down. This calls less for agile-style permanent revolution than for well-defined, repeatable and optimized support processes, for which the service management frameworks describe lots of time-tested best practice. Service management best practice provides a framework for quality-assured service delivery and governance, while the adoption of agile principles in their service management processes enables organizations to be flexible in the face of changing customer needs. It would thus be wrong to dismiss the established service management concepts as no longer relevant. Agile and a number of associated lightweight software development methods evolved in reaction to heavyweight methods that were often criticized as overly regulated and micro-managed, such as the traditional waterfall approach. A particular problem of the heavyweight methods are their long design and development cycles. These are incompatible with today's need for flexibility and continual innovation, driven by business environments, customer requirements and technologies that are in constant flux. Against this background, Agile is seen as way for slow-moving 'dinosaur' organizations to become nimbler and more flexible, able to respond quickly to changing customer requirements. The idea is to test new products and services on a small scale, perhaps using a prototype, and go from there in small cycles, taking into account customer feedback at every stage. Changes to requirements can thus be welcomed rather than feared or even refused, resulting in faster realization of benefits and reduced business risk. Is Agile for all service providers? The Agile mind-set has its roots in software development, and has more recently also been used in other areas, including the service industry. But the extent to which agile principles can be applied will not be the same in every organization. As an example, an organization offering health services typically requires many sizable assets such as medical equipment, buildings, medical staff, etc. Healthcare is also a highly regulated sector, and service providers have to comply with various laws, rules and regulations. In such an environment, starting out the agile way with a 'minimal viable service' and introducing improvements in small, incremental steps is not as easy as in other, less asset-heavy and regulated industries. Of course, this does not mean the agile philosophy is completely unsuitable. Agile is not a standard, and all organizations are encouraged to explore Agile to find out how it can help with improving their operations, using their own judgement. For instance, service providers in healthcare may not be able to adapt their services in very short cycles, but they may still benefit from the idea of eliminating existing silos and putting cross-functional teams in charge of the services. As in software development, this ensures that information is flowing more freely, and everyone is focused on continual improvement and creating value for the customer. Are the YaSM process templates compatible with Agile principles? One of the Agile principles states that 'simplicity is essential', so YaSM and Agile should be a good fit: Simple, clear-cut and easy-to-read processes were a key objective when creating the YaSM model. YaSM is not specifically aligned with the Agile mind-set, but it's not hard to see how the YaSM process templates and Agile can go together. First of all, the YaSM process structure is based on the service lifecycle. The YaSM service lifecycle processes describe in a straightforward way how services are to be designed, built, operated and improved. It's thus perfectly feasible to go through the service lifecycle more frequently, which enables organizations to break work into smaller chunks and be more responsive to changing customer needs. What's more, the service improvement process is in fact a smaller cycle within the overall service lifecycle, so this process can be used as a lightweight approach to enhancing services in incremental steps, possibly with a service improvement plan (or 'backlog' in Agile terminology) in the form of a Kanban board. The key role in YaSM responsible for managing the services across their lifecycle is the service owner. In the traditional service management frameworks, the service owner will draw on the support of other roles, such as technical experts and administrators. This sounds somewhat like the siloed approach to working that Agile aims to overcome, but injecting more agility into the service lifecycle processes is not too difficult: Organizations can, for example, assign service ownership to cross-functional teams that are responsible for managing their services across all lifecycle stages. Finally, the YaSM model provides time-tested process templates for the many bread-and-butter processes in the service provider organization, where efficiency and effectiveness matter more than agility. Examples are incident and service request management, problem management, configuration management, supplier management, compliance management, etc. So the YaSM model is not specifically aligned with Agile, but with its streamlined, straightforward set of process templates, YaSM gives organizations a kind of skeleton for their service management processes, and the flexibility to build Agile principles into these processes. Where can I learn more about Agile? [a] Gaskin, Michael (2018). Building a better IT org with YaSM and SAFe. -- LinkedIn Pulse publication, August 29, 2018. Retrieved September 30, 2018. [b] Esser, Jörg (2018). Agile like ants: five simple rules for adaptive companies. -- Roland Berger publication: Simple smart spark resilience (download available), May 23, 2018. Retrieved September 29, 2018. [c] The fashion for agile management is spreading. -- The Economist (2018). Retrieved September 09, 2018. Kent Beck et al. (2001): Manifesto for Agile Software Development. Retrieved September 28, 2018. Agile software development. -- Wikipedia. Retrieved September 26, 2018. Falkowitz, Robert (2018). Kanban eLearning. In: This View of Service Management. Retrieved September 26, 2018. Falkowitz, Robert (2017). A Manifesto for Service Management Agility. In: This View of Service Management, November 24, 2017. Retrieved September 28, 2018. What is Agile? › Methods and concepts › Agile service management › Does Agile replace ITSM? 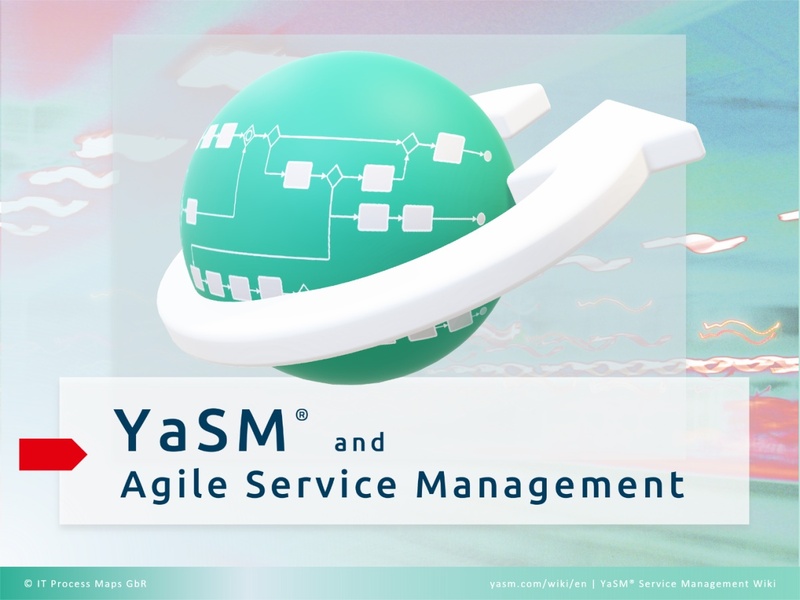 › Can YaSM and Agile go together?